Of the 4th Frimaire, year two of the Republic; on the era, the beginning, and the organization of the year, and on the names of the days and the months. The era of the French is counted from the Republic, which took place September 22, 1792 of the vulgar era, the day when the sun reached the true autumn equinox for the Paris Observatory by entering into the sign of Libra, at 9:18:30 in the morning. The vulgar era is abolished for civil usage. Every year begins at midnight of the day of the autumn equinox for the Paris observatory. 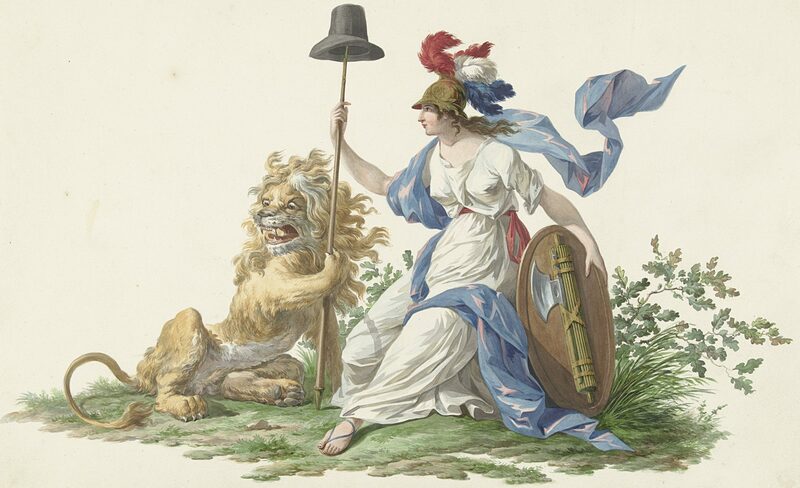 The first year of the French Republic began at midnight September 22, 1792, and ended at midnight separating the 21 from the 22 September, 1793. The second year began September 22, 1793 at midnight, the true autumn equinox having arrived that day for the Paris Observatory at 3:11:38 in the evening. 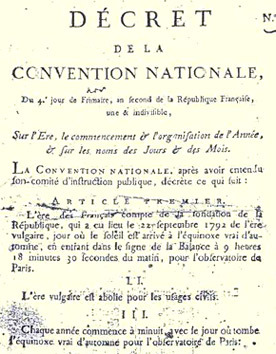 The decree that fixed the beginning of the second year on January 1,1793 is repealed. All acts dated the second year of the republic passed between January 1 and September 21 are regarded as belonging to the first year of the Republic. The year is divided into twelve equal months of thirty days each. The twelve months are followed by five days that complete the ordinary year; these five days don’t belong to any month. Each month is divided into three equal parts of ten days each that are called decades. For summer: Messidor, Thermidor, Fructidor. The last last days are called Sansculotides. In order to maintain the coincidence of the civil year with celestial movements, the ordinary year receives one extra day according to the requirements of the position of the equinox. This day, called the Day of the Revolution, is placed at the end of the year and forms the sixth of the Sansculotides. The period of four years, at the end of which this addition of a day is ordinarily necessary, is called the Franciade, in memory of the revolution that after four years of efforts led France to a republican government. The fourth year of the Franciade is called Sextile. The day, from midnight to midnight, is divided into ten parts, or hours, every part into ten others and so on until the smallest measurable duration. The 100th part of the hour is called the decimal minute; the 100th part of the minute is called a decimal second. This article only takes effect on the first of Vendemiaire, year three of the Republic. The Committee of Public Instruction is charged with having printed the new calendar in different formats, with simple instruction al material to explain its principles and its use. The calendar, as well as the instructional material, shall be sent to administrative bodies, municipalities, tribunals, judges-of-the-peace and to all public officers; to the army, to the popular societies, and all colleges and schools. The Provisional Executive Council shall pass it on to ministers, consuls and other French agents in foreign countries. All public acts shall be dated following the new organization of the year. Professors, teachers, mothers and fathers of families, and all those who direct the education of children shall hasten to explain to them the new calendar, in conformity with the annexed instructional material. 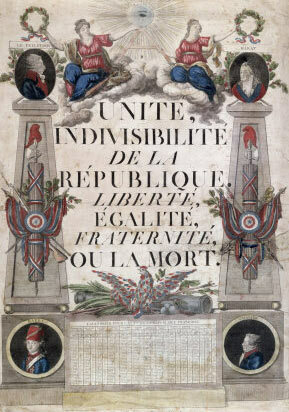 Every four years, or all the Franciades, on the Day of the Revolution, the Republican Games shall be celebrated in memory of the French Revolution.